Can you pick and choose parts of Montessori? Can you pick and choose parts of Montessori? Can you use what you like and not the rest? I write about Montessori in the home, not Montessori schooling. While there is a complete system (and yes manuals and training courses) for Montessori schooling (the Montessori Method) there is no book or guide for Montessori in the home. There are lots of useful resources but no complete, thorough guide. No step by step. It's for this reason alone that I find it difficult for anyone to say that they have a complete system for Montessori in the home or Montessori parenting. I know many people would get close but that's not for the majority of us no matter how hard we tried. So for most of us, yes, we pick and choose Montessori. We do what we can, when we can. We start with what is achievable, what is within our scope, within our resources and work from there. Just like schooling however I feel that starting young, starting with the foundations, Montessori works best when implemented as whole, as fully as possible. I think we would all agree that consistency with children is paramount. Consistency within our own actions, consistency with care givers and consistency between home and school (or daycare). It makes no sense to a child to allow freedom and independence in one area but not the other. Montessori is a parenting philosophy, it is a mind set. But many parents aren't there yet and if that means they are only implementing parts of Montessori then I think that's ok. A little Montessori is better than none. I know of very committed Montessorians who have used cribs, disposable diapers, pacifiers, baby walkers. I know of committed Montessorians who send their children to mainstream schools. And I know of many families who are committed to Montessori schooling but practise very little Montessori in the home. So my overall thoughts are the more Montessori the better, but there is no prize in parenting. No award for the parent who offers the most activities. If the floor bed works for you - that's great. If not, well that's ok too. If Montessori encourages your to cook, garden or go on a nature walk with your child that can only have a positive effect! As for labels, that doesn't end well for anybody. What is a Montessori home? When can we say we are a Montessori family? I think if we are Montessori inspired - that is enough. Pitchers, Cookie Stamps and More. Shop Update. The best thing about having your own store is being to curate your own collection. While at home we have used this same pitcher in the medium size I didn't even know it existed in the smaller size. The small pitcher is 250ml, perfect for a toddler to pour their own drink. Otis is also using the toddler tumbler which is 140ml. Both are the perfect size for a toddler and the pitcher is nicely balanced with an easy hold handle and nice wide rim for pouring. Otis and I have been baking some treats using these wonderful Ceramic Cookie Stamps. Remember I'm baking with a two year old so I'm sure they would turn out even more spectacular in your home or with an older child. Here we've used the Christmas Crescent recipe from Wholefood Baking by Jude Blereau (which is like a festive shortbread). The star cookie stamps would be lovely for Christmas gifts however I love the idea of creating a family tradition with other designs or for other festivals. The other designs include Moon, Sun, Flower, Hearts, Bear and Cupid. You know I love a good kitchen gadget! Here Caspar is using the Kids' Mini Chopper. The blade is plastic so it's completely safe for the child to assemble and clean. Simply place the food in the bottom cup or directly on the chopping board and press down the pink hat to chop. Other items new this week in practical life include a metal shaker which is great for threading and we've updated the transferring set. Our clothes lines are also back in stock. Most of our new items this week are in the kitchen. We have Mini Trays in a variety of colours and silicone Dinosaur cup cake moulds. Unfortunately we still have a number of items out of stock. Some items are selling very quickly while others take a bit longer to get back in. Apple Pie Moulds and Strawberry Slicers are back in stock. We are not expecting a lot of new items this next week so I hope you enjoy this selection! Working with what you've got! There are days when I just know that Otis needs something new and engaging on his shelves. He has his favorites but often he's restless, needing something new for stimulation. Sometimes it's just the newness of an activity that gets his interest. I open our cupboards, often our kitchen cupboards, art cupboards. I walk through our garage. Thinking, thinking. Hoping that something will come to mind. And it usually does. I've never set up an activity like transferring pom poms before, but remember I'm getting desperate and he loved it. Sink and float? Open and close? Locks? How about magnets? There are endless opportunities to use everyday household items for activities. It takes me approximately two minutes to prepare. It's always good to have a couple of spare trays. It's also good to always have a few ideas in the back of your mind (this is when Pinterest is useful). But when all else fails I just look to what we have and hope that inspiration strikes. Otis often surprises me in what he is interested in. Don't think that something is too 'young' or too 'old' for the child. If you are not sure give it a go. Transferring pom poms was easy but engaging, he's practising to master. Magnets were easy too however it was a new concept, something new to think about. Most of all I love it when he rushes to his shelves when he's noticed something new. And I know that I've prepared the tray working with what we've got. What we are reading October! This month I wanted to share three authors that we have been enjoying. Three fantastic authors and great illustrators too. Amazingly my book wishlist is getting low but I guess it's time to start thinking about Christmas titles too. This post contains affiliate links. I've mentioned previously that Otis loves Lois Ehlert's Eating the Alphabet which we have as a board book. Straight away her other titles were recommended and I wasn't disappointed. If you love bright and bold colours you will love these. Planting a Rainbow and Lots of Spots are stunning. Perfect for children like Otis who won't sit for a long story and need a lot of visuals to keep their attention. We also love Planting a Rainbow because we can identify many of the plants in our own garden. This series from Dianna Hutts Aston and Syliva Long has also come highly recommended. Simply the most beautiful and engaging books about nature. They highlight the beauty and wonder in the world. It has stimulated many discussions (with Caspar) about how amazing our world is. Perfect for inquisitive children. Although we haven't read it yet, An Egg is Quiet is also a part of the series. For home or school I think these are classics. I came across Joyce Sidman when I was looking for children's poetry. The Dark Emperor and Other Poems of the Night is perfect poetry for bedtime. Swirl by Swirl - Spirals in Nature is illustrated by Beth Krommes, they have also worked together on Butterfly Eyes and Other Secrets of the Meadow. Let's say her illustrations are... bold and captivating. As always I'd love to hear what you are reading. Caspar started Little Athletics. It's the most organised, most inclusive and least competitive sport he has tried so far. And he gets to wear special athletics shoes! It's hard to pick Otis' interests. He's really interested in everything! I knew these large insect magnets would be a hit. We have one particular spot on our walk where Caspar likes to pick up rocks. He needs a bigger jar. On our nature table. Pinecones, rocks and feathers. Gardening teaches patience. Otis has grown these from seed. When I mention Montessori items, I'm thinking Montessori in the home, not for homeschooling but for living. Not necessarily Montessori designed materials but materials and toys a Montessori family might find useful and enjoy! If you are in the U.S, this post is for you! These are all Amazon affiliate links. Items the same as stocked in How we Montessori Shop. I have complied gift guides before with many links. Here are a few more ideas. Otis recently recieved a set of these huge magnetic insects which I can highly recommend. If you are in the US you are really fortunate to also have access to Montessori Services and Michael Olaf. 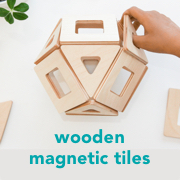 Etsy is also an excellent place to find Montessori at home materials. I am still short of ideas for Montessori at home shops for Europe and Asia. If you have some suggestions please leave a link. There are so many words to describe the last two weeks. It has been crazy fun and crazy busy! What can I say other than you are an amazing group of parents, teachers and care givers. I've learnt there is a strong demand for Montessori materials for the home and that Montessori in Australia is alive and well! I am now concentrating of getting my stock levels back up and introducing new products. The intial range was based on the essentials while now I am purchasing lots of the fun items and broadening the base range. I have recently listed three new sets of blocks, of which Caspar and Otis are enjoying. Puzzles and new kitchen items will follow soon. I've also updated the photographs of our aprons which look fantastic. Otis is also thrilled at having new matching cards to work with and today worked with all these pictured. These cards are also great for building vocabulary. This week I hope to get back to posting here with some regularity and also have lots of books to share in our what we are reading page. Thank you for your patience while I've taken some time out from this space to attend to the shop. For overseas readers I'm compiling a list of where you can get some of our products (or very similar) closer to home. International shipping isn't always an option and when you can it's best to get items locally. Tomorrow I will post my Favourite Montessori Items on Amazon list! However I'd love to share with you other sources of Montessori in the home products across the US, UK, Europe and Asia. 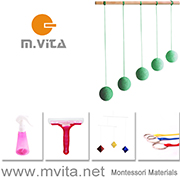 If you know of a store that stocks Montessori materials that you can recommend or would like to share, please leave a link. I know lots of readers would appreciate it. Let's compile a list of Montessori (in the home) resources across the world. I know with your help we can do it. Some days Otis could work all day. He did all of these repeatedly after spending the morning at our Montessori Parent-Toddler Class. If you have taken a photograph of your children using some of our materials and you would like to see them published, please email them to howwemontessori@gmail.com. A few weeks ago Irene sent me a picture or two of her son Joshua working. In the background I could see his work shelves and of course I asked to see more. I was delighted by this clean, simple but inviting Montessori environment. I hope you enjoy the tour! Words by Irene. My son Joshua is 20 months old at the moment and we live in Melbourne. We have been following Montessori since he was around 6 months old. I became interested in Montessori as my husband is a Montessori child himself and he attended a small local Montessori kindergarten. Once I had a little time on my hands I started looking into it and the independence, free thinking and sense of order that Montessori encourages really resonated with me. I have always admired my husband's creativity, spatial awareness and problem solving abilities, qualities I think he developed through his early Montessori experiences. It pleases me that Joshua is showing the same qualities and loves working to build things as well as mastering puzzles, posting items and shapes. Montessori has taught me to follow the child’s lead and provide the tools support his learning in an environment that is orderly with beautiful materials. At 20 months it has become clear to us that the environment we have provided for him has been invaluable in assisting with his development. His concentration level has improved so much and he appreciates beautiful things around him. My reading started with recommendations of "How to Raise An Amazing Child the Montessori Way" by Tim Seldin, "Teach Me to Do It Myself" by Maja Pitamic and "Montessori from the Start" by Paula Polk Lillard. These were my first books to get a good idea for activities and processes to encourage and implement at home. I am currently reading "The Joyful Child" and “Child of the World” for further ideas and information. I loved the above resources as they speak to the reader in an easy way which makes implementing Montessori at home very simple and not as daunting. I get a lot of inspiration from blogs and online resources - of course How We Montessori, The Full Montessori, Montessori Child, Feeding the Soil and recently Sixtine et Victoire for ideas on work spaces, activities and general thoughts on positive parenting. Pinterest is also a wonderful resource for finding and pinning ideas I have so that I can refer to them at any time. I have also found Aid to Life, At Home With Montessori and Michael Olaf are also fantastic for information on specific issues such as toilet learning and encouraging movement and dexterity. We also attend a Montessori Toddler group so there are sources of inspiration there for activities but also for presentation of activities, for example Joshua seems to be more drawn to painting and cleaning there simply because of the different presentation so I observe and change things at home to facilitate and promote these interests. Joshua’s work area has evolved considerably since he was born and continues to do so as his needs and interests change. 1. MAIN WORK AREA: This is located downstairs and we have set aside an area in our living room as Joshua enjoys working nearby while I am cooking or cleaning. Often he will come and get up on his step-stool and either take his afternoon snack and watch me cook or will want to help cut things up and sample. He works with his own tools - he has a chopping board, wavy chopper, whisk and a few other things. Baking time is particularly fun, I try to bake with Joshua at least once a week. As the living room adjoins the kitchen and is tiled, we decided to put down a large low pile mat to define the work area. Practically speaking it is also a lot nicer to work on a mat rather than sit on the cold floor. We put in cube shelving as it was nice and low for accessibility when he was younger but we added another taller shelf as his interests changed. He has a small table and chairs and a small art area where he draws on the blackboard or paints when he feels inspired to. We keep a small woven basket on the shelf. On our daily walks Joshua collects a few small treasures such as little sticks, rocks and flowers which he deposits into the basket when he returns. This is available for him to explore at a later time at his own leisure. His particular collecting interest at the moment is stones, he was excited to find some white quartz stones the other day. Other materials in the shelves are rotated periodically based on my observation of his interests. A set of unit blocks that are permanently on display and easily accessible. Joshua has showed very strong interest in building blocks so these are displayed invitingly (inspired by How We Montessori). Joshua’s Christmas present is more unit blocks and this will complete the set he has with some more complex pieces so that he can commence undertaking some further exploration. 2. VEGGIE PATCH: We recently updated our garden to include a veggie patch. Joshua is responsible for watering the patch every day and keeps pointing to his favourite, the tomato plant. I think he is anticipating eating some lovely home grown tomatoes in the not too distant future, I hope our patch can oblige him. This is teaching him a love of plants and on our walks everyday he is more interested in flowers, trees, leaves and other bushes. 3. TOILET LEARNING AREA: We have two stations, one upstairs and one downstairs. These are easily accessible and have been set up to facilitate the toilet learning process. We make clean trainers and underwear available in baskets and a bucket for washing. The basin is easily reachable for washing hands as we have a sturdy step and the upstairs basin serves as water play, care of self and for washing hands. 4. SNACK AREA: This has been setup on a small table that was made by Joshua’s great grandfather and will eventually become Joshua’s bedside table when he is ready for a big bed. I try to make this area interesting by rotating the picture on the wall of beautiful art works. I am particularly interested in impressionist artists so I have been putting a few of my favourites there for Joshua to appreciate. I am looking at getting some life prints of butterflies and bugs to display as he has expressed a strong interest in these lately. 5. DRESSING AREA: Joshua has a cube chair that serves is multipurpose – he sits to help dress himself in the morning but he can also stand on the chair and look out the window or push it over to the light switch and turn the light on and off. Joshua also has a laundry basket in his room that he puts his used clothes into before bath time each night. Tuzzles Puzzle – Purchased through Windmill Toys, a local toy shop. They are also online. This has been amazing for understanding graduating sizes of different shapes. Something similar is available from Michael Olaf online. Liquid timer – Purchased through Montessori Child and are fascinating to watch. Mini Knobbed Cylinders – A2Z Montessori Australia (however these can be purchased through several suppliers but I felt that the quality of these ones were wonderful). Joshua has pretty much mastered this one but there are still a few areas of difficulty, specifically presenting more than two together is very involved and tricky at the moment. Unit Blocks – Unfortunately Australia does not seem to not have many, if any, suppliers of quality unit blocks that I could find. These are Plan Toys Unit blocks (I think these are a 50 piece set) however I have found that there are many American suppliers of Unit blocks. One that I particularly admire is Carolina Pratt Unit Blocks which stocks large sets and individual pieces. They are a worthy investment and are made from Hard Rock Maple and will be a beautiful addition to our collection sometime in the near future. Irene also mentions that Joshua has a second work area upstairs where they have utilised an existing bookshelf and devoted the bottom shelves to Joshua's materials. This is an area where he can work when he wakes in the morning or while Irene is doing household chores upstairs. A sincere thank you to Irene for the gorgeous pictures and detailed explanations. Thank you for sharing your spaces with us Irene. You can also find Joshua's gorgeous little tea set at Windmill Toys. 1. Absorbent Minds (UK), 2. Michael Olaf (US), 3. Michael Olaf (US), 4. For Small Hands (US), 5. How we Montessori Shop (Aus), 6. How we Montessori Shop (Aus), 7. Montessori Shop (NZ), 8. Montessori Paratodos (Spain). One of the things I love about Montessori is the approach to aprons. Aprons are more than something to protect the child's clothing. Aprons are a part of the environment, they are a material, a learning tool. By putting the apron on at the start of the activity and taking it off (and putting it away) at the end, the apron helps to define the activity. While the apron is on we are working, we are cooking/washing/flower arranging. We consider the uses of our aprons, in our home have an apron for food preparation, an apron especially for juicing, an apron (made from toweling) for washing, another for gardening/flower arranging and the children have aprons they wear for messy arts. Each apron has it's own particular use. I have written many posts about aprons and the one thing I look for is an apron that fits and that the child, even a toddler, can put it on and take it off themselves. An apron is like a piece of clothing, wearing it, using it is an activity. The child learns to take it off the hook and methodically put it on. When the child is very young or still learning I offer as little help as possible, only giving the child as much assistance as necessary. This helps foster independence and lessens their reliance on others, promoting their sense of self. In our home we promote the helping of others as in a classroom, the older children help the younger children or the older sibling helps the younger sibling. Temporary hooks are ideal for hanging aprons when the children are young as we gradually increase the height of the hook as the child grows. It's ideal to have a hook or a special place on the shelf for the child to store their aprons near the activity where it is used, a place where they can always find it and put it back, promoting the child's sense of order. Although it doesn't always happen in our home, on occasion the children launder their own aprons. This gives the child something real of their own to wash, rinse and hang. We've made and purchased many aprons. I have listed Toddler and Child aprons, cotton and water resistant in the shop however Etsy is also a great place to source handmade aprons. Some of my favourites on Etsy include Handmade Montessori, Lila Kids, Common Thread Kids, Goose Designs and The Prepared Environment. It's also wonderful to see so many suppliers of toddler aprons! This is a shot of Otis demonstrating how to put on the apron! Love those little hands. Please check back tomorrow as I have an exciting post for you! I will be featuring the home of a gorgeous 20 month old boy in Melbourne. How we Montessori Shop is OPEN! How we Montessori Shop is now open. Please have a look at our Customer Service page first. I'd love to hear your feedback, comments and suggestions. One of the most calming experiences for a child is concentration. Deep concentration can occur while digging in the sand, washing carrots, stringing beads, drawing with color pencils, doing a puzzle, or polishing a mirror; we never know when it will begin, but recognising it is necessary if we are to protect it. - Susan Mayclin Stephenson. The Joyful Child. The link to the shop will remain on the left side bar for future reference. Thank you for all of your support. I hope that even if you don't find yourself buying today that you will find some ideas or inspiration from the shop. Here is a list I have started of my favourite Montessori quotes. I'd love to hear your favorite quote if you have one. How we Montessori Shop will go live soon, the morning of Thursday 3 October 2013. The site has been tested so hopefully it will run smoothly. Please let me know if you encounter any problems. The site is just a beginning. It's small and modest. I have so many ideas and so many plans. It will take time but please let me know your wishes or products you would like to see. I've had so much fun and worked hard to bring you this range of select items. My focus is and will always be on practical life for the child in the first plane of development. Our stock levels vary, some items we have many and other items we have only a few. If an item says sold out we will work to restock the item soon. When you first get onto the site I recommend reading our Customer Service page, it outlines details like shipping. I hope you enjoy viewing the shop. There are many items still to come so check back often!